Barcelona had a perfect start to the Champions League on Tuesday as they thrash PSV 4nil at Camp Nou in a match that sees Messi scoring 3 goals. Though the match started at a slow pace as PSV decided to sit back and play Barcelona on counter attacks, The game later opened up and Barcelona was able to start the season with a win. It was no surprise that Lionel Messi got a hattrick as he was everywhere during the game. During the post-match press conference, Valverde praised Messi's performance and claim the Argentine always does extraordinary things. 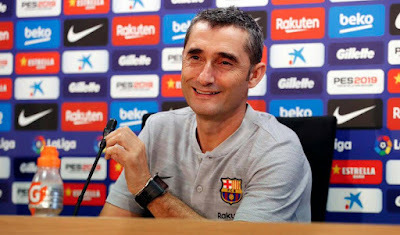 Valverde also revealed the game and also spoke about how PSV started the game and how important the 3 point is for Barcelona.